The memorial to officer Ahmed Merabet looks more somber and simple today. And although the monument occasionally gets graffiti bombed; its message remains clear, transmitted in the depiction of the fallen police officer, Ahmed: to play a role in making the world a more collectively healing place. In practical terms, maybe doing a good deed for a neighbour. At least for me, that’s what it transmits. A portrait of officer Ahmed used to sit alongside a small bunches of flowers. But it’s no longer there. The memorial where the act occurred remains. And one that is now calm but which at one time was highly-charged, visited by those who came in droves to make their personal and emotional tributes. Memorial locations like this one are very public and can’t be passed-by unnoticed; they’re public. Their locations put them in easy reach for passersby to pay their own personal tributes. Nearby this somber memorial too is the office of Charlie Hebdo where the walls remain marked with subtle mementos. I pass officer Ahmed Merabet memorial each time I cycle along the route between Bastille and Republique. 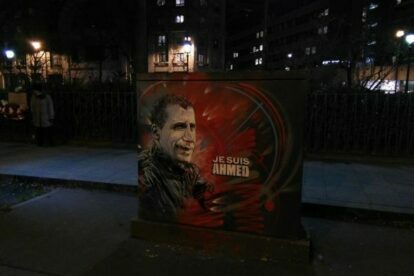 The image of the French police officer lies along the main Boulevard Richard Lenoir a route which links Place de La Bastille and Place de La Republique. A place of immense emotion, at one time expressed in flourishes of hand-written messages which dressed the railings, has now found its just and somber atonement. The floral tributes and this artistic endeavour a just tribute.